Although the degree of residual ridge resorption following tooth extraction is unpredictable, resulting deformities are not an inevitable occurrence. Preservation of the alveolar process can be achieved through immediate restorative and periodontal intervention at the time of tooth removal. 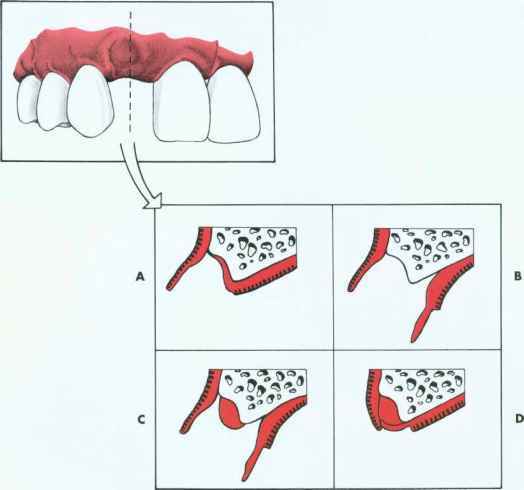 By conditioning the extraction site and providing a matrix for healing, the pre-extraction gingival architecture (or "socket") can be preserved. Fig. 20-4. 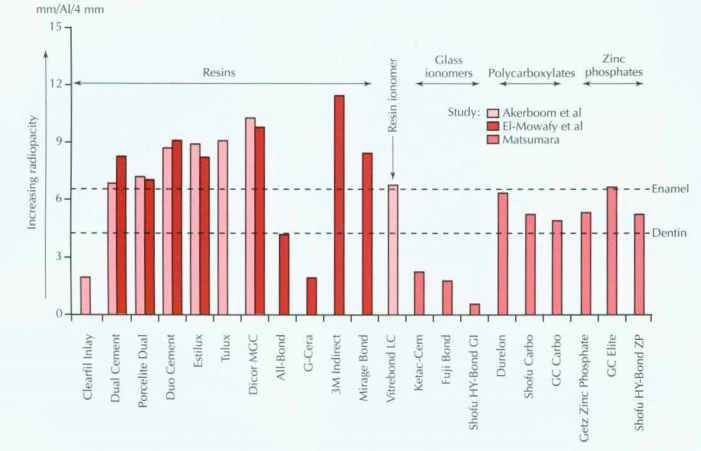 Residual ridge deformities as classified by Siebert.2 A, B, Class I defect. C, Class II defect. D, Class III defect. Fig. 20-5. The roll technique for soft tissue ridge augmentation. A, Cross section of Class I residual ridge defect before augmentation. B, Epithelium removed from palatal surface. C, Elevation of flap, creating a pouch on the vestibular surface. D, The flap is rolled into the pouch, enhancing ridge width. Fig. 20-6. The pouch technique for soft tissue ridge augmentation. A and B, Split-thickness flap is reflected. C, Graft material placed in the pouch increases ridge width. D, Flaps sutured in place. Fig. 20-7. 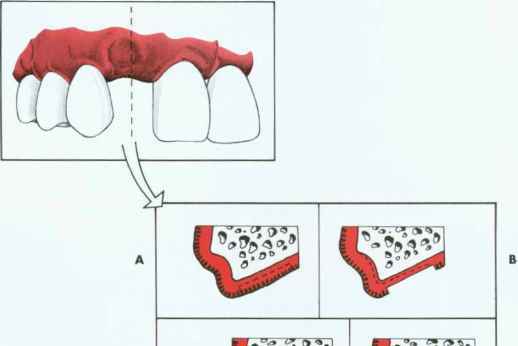 An interpositional graft for augmentation of ridge width and height. A, Tissue reflected. B, Graft positioned and sutured in place. 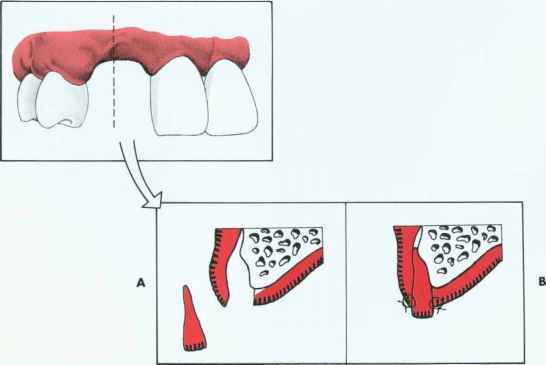 before or during extraction, the sockets can be grafted with an allograft material (hydroxyapatite, tricalcium phosphate, or freeze-dried bone) .12-14 Immediately after preparation of the extraction site, a carefully shaped provisional FPD is placed (Fig. 20-9, A and B). The tissue-side of the pontic should be an ovate form, and according to Spear, s it should extend approximately 2.5 mm apical to the facial free gingival margin of the extraction socket (Fig. 20-9, C and D). Because the soft tissues of the socket will begin to collapse immediately after the tooth extraction, the pontic will result in tissue blanching as it supports the papillae and facial/palatal gingiva. The contour of the ovate tissue-side of the pontic is critical and must conform to within 1 mm of the interproximal and facial bone contour to act as a template for healing. Oral hy giene in this area is difficult during the initial healing period, so the provisional should be highly polished to minimize plaque retention. After approximately 1 month of healing, oral hygiene access is improved by recontouring the pontic to provide 1 to 1.5 mm of relief from the tissue. 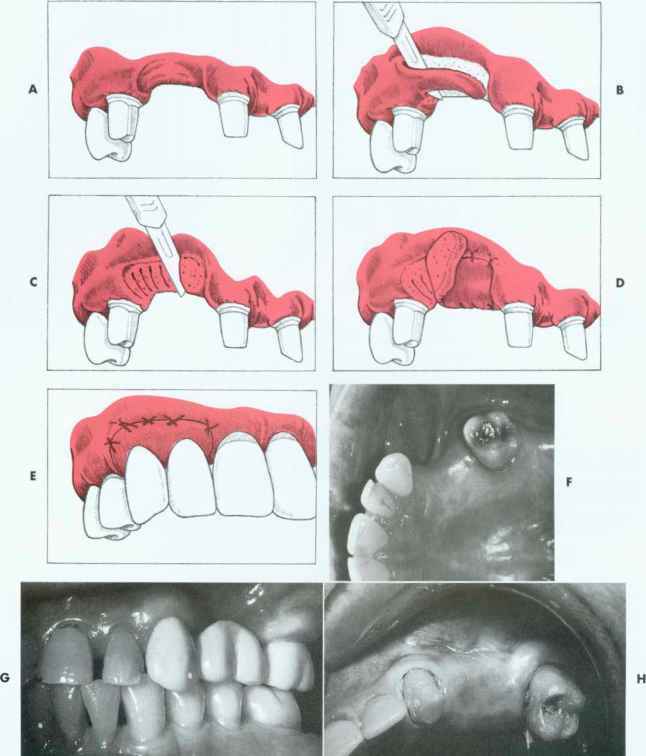 When the gingival levels are stable (approximately 6 to 12 months), the final restoration can be fabricated (Fig. 20-9, E). Although maintenance of the residual ridge following extraction is meritorious, socket-preservation techniques are technically challenging and require frequent patient monitoring and conscientious patient hygiene. Even when the procedure is performed meticulously, success is unpredictable because of the variability of patient healing response.